all because two people fell in love: Catching Up!!! I can't even use the excuse that I've been overly busy here lately because truth be told I really haven't. Pictures to prove it, we haven't had much going on here the last couple weeks. I've simply been slacking in the blog world and need to get my booty in gear. Our time here in the South is quickly coming to a close and we've been slowly getting things ready for our move. HHG purging, working on some DIY projects and eating everything in the frig and freeze. Not to mention the deep cleaning. We're trying to save every penny we can with this move so I've been doing little by little each weekend. It hasn't been all house work and packing through I've managed to have a few outings with the girls. *Up bright and early for our last Graduation "Rights of Passage" Ceremony. This is were the SIT aka PVT's officially become Soldiers and place their Beret on for the first time. Becky, Julie and I got up around 5am and made our way out to the range for the ceremony. It was so cold!!! Thankfully each Company had fire pit they were all huddled around. 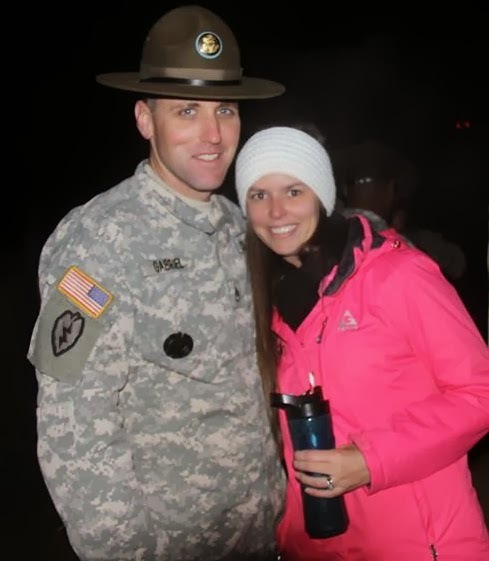 My handsome Drill SGT and I at the "Rights of Passage" Ceremony. 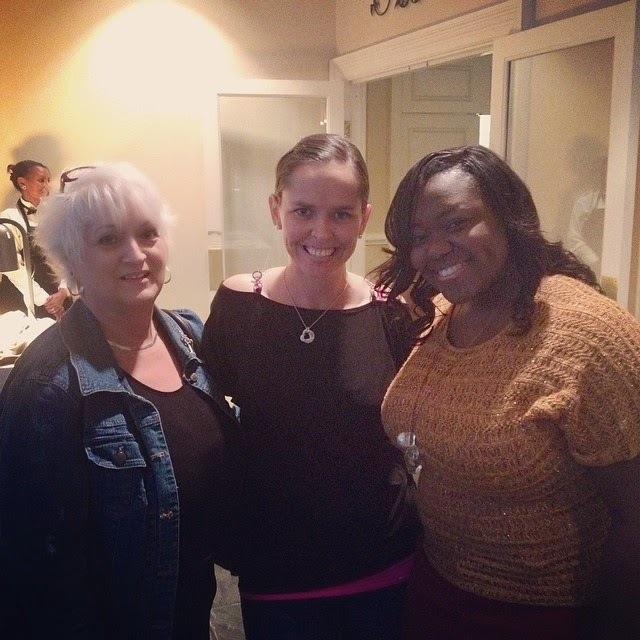 *Becky and I had a girls night out at a Victory Spouse's event. Denim and Diamonds Auction at Weston Lake. 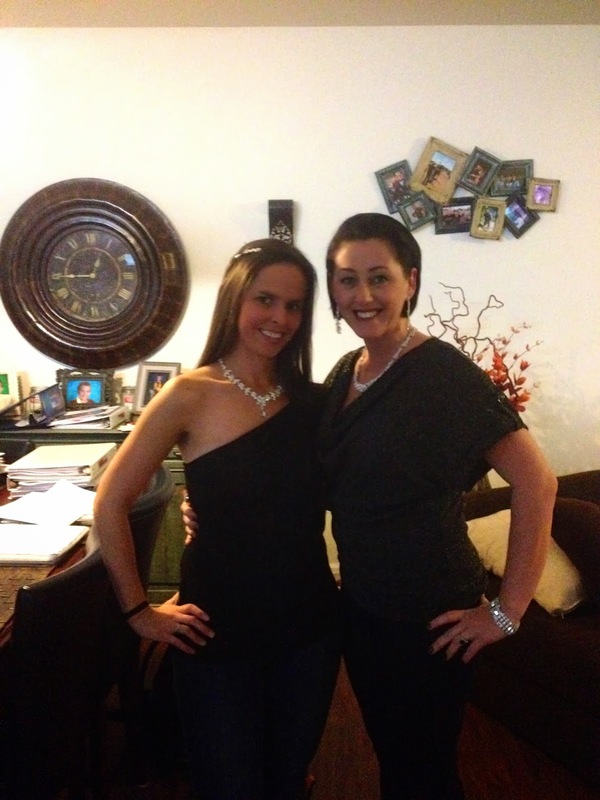 We got all dolled up, Becky even purchased some fun Diamonds for us to wear. Sadly enough though it was nothing like either of us expected. The auction items were less than impressive and dinner well it wasn't to bad. The best part about the evening was getting to hang out with this fabulous girl. *BCT Victory Concert, day before Family day. At the end of each Cycle the day before Family day the SIT attend a concert put on by Eric Horner and his wife Debbie. The SIT are able to order pizza, soda and candy. All of which they haven't had in the past 10 weeks. Eric puts on a concert with patriotic songs and a slide show of pictures plays from the last 10 weeks of training. Rebecca and I along with a few other FB Volunteers from our Battalion attended and took loads of pictures to put on FB for the families. It's a chance for the SIT to kinda of let loose for a bit and have some fun. A fun part about it is, most of them take their pizza boxes once they are empty and will write messages on them to their families. Up close and personal with some of our Delta SIT. 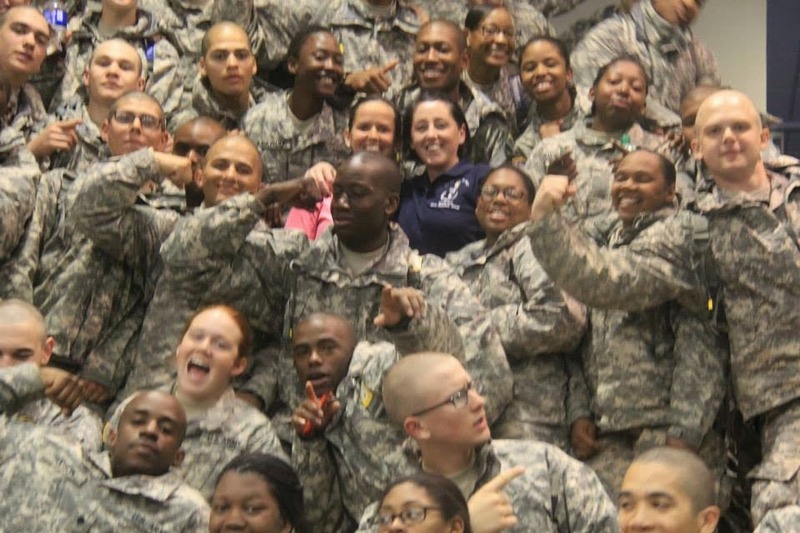 Supporting out Drill SGT's with their PVT's. 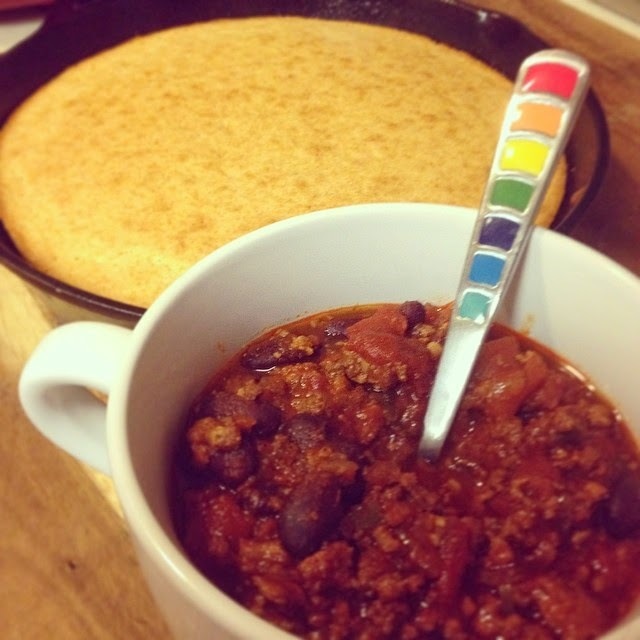 *Taking full advantage of the chilly weather you would have though I would have made this fabulous chili before now. NOPE, just now getting around to it on a perfectly warm Southern evening. That didn't matter though it was still fabulous. As was the corn bread to go along with it. Sidenote: I'm LOVING my new cast-iron skillet the hubbs got me for Christmas. I use it for everything. Since we are on the subject of food, I'll go ahead and share with you this super yummy dish. 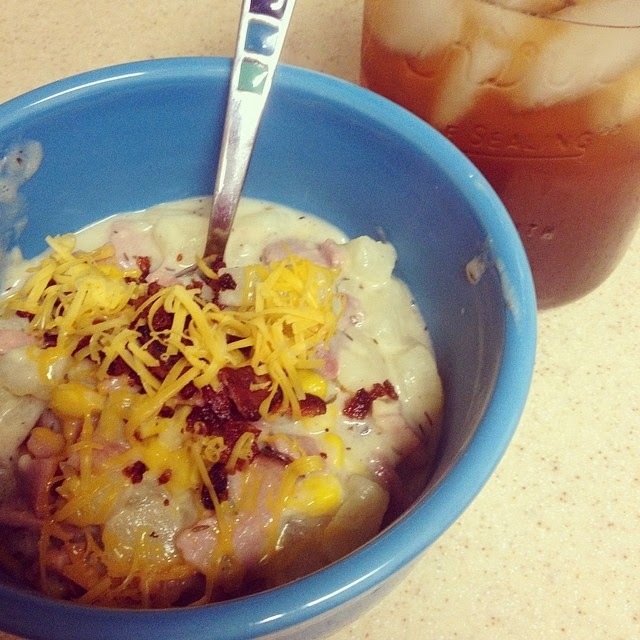 Potato, Corn and Ham Chowder, of course it wouldn't be complete with out some tasty Peach Tea to go along with. Using left over ham from Thanksgiving that I had frozen was the best part of this. Operation clean out the freezer is in full effect. *This past Thursday night was my School's Spring Art Auction at Leaside. Every year in the past we have had it at the school and its been a family event. This year they change things up a bit and made it a adult only event. Catered in food and served alcohol. I wasn't planning on going, in the past we've been required to go because it was at the school. Since things had change we as staff were not required to go. I took a babysitting job for the night (a month in advance) with one of my favorite families here. That was until my classroom mom informed me that she had purchased my ticket to go to the event. As a "Thank You" for everything I've done this year. (tickets were $40 each, not cheap for the evening) A couple of our other parents got together and bought tickets for the hubbs and the other teachers in my class. Although only one of them came (Ms. Elaine, bottom left) I convinced Jamie (bottom right) to come along with us and gave her our extra ticket. It ended up being a great evening. The EDSPO really out did themselves on the event. I foresee many more of our Spring Art Auctions in the years to come here. I was so happy that many of my parents current and past were finally able to meet the hubbs. They hear so much about him so finally being able to put a face with a name and story was nice. *On another note: This kid below Graduated from College this past Tuesday. I couldn't be more proud of my little bubby. He's completely turned his life around in the past year and I can't wait to see what is in store for his future. We were at each other's throats growing up, many times we hated each other but now I'd do just about anything for him. He's my best friend and I'm so glad I'm able to call him my Bubby!!! 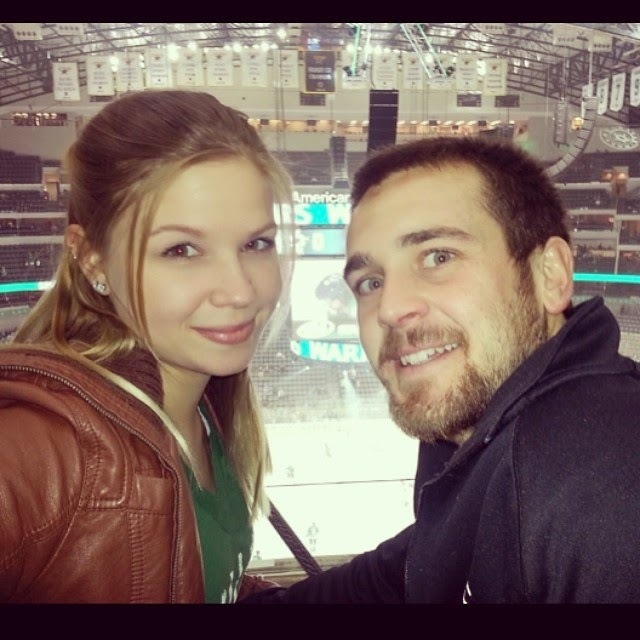 His beautiful Girlfriend Becca treated him to a Dallas Star's hockey game the night before Graduations as his gift from her. He loved loved (still does) the Dallas Stars growing up so this was right up his alley. I only wish I could have gone home for his big day but soon enough I'm hoping to make a trip home. That's just a bit of life lately and what's been going on with us. I feel like we have a lot more going on with the move but its just not all blog worthy exciting so I'll spare you the details on that. I do plan on posting about our DIY projects and other happenings in the coming weeks. Thanks for sticking it and out hanging in with me!!! Youve been so busy! That was really sweet that the moms bought you a ticket, I am sure they are going to miss you too! There are always so many things going on right before a move!! If it makes you feel any better, I still haven't fully unpacked ;) Good luck with everything. It's come to a end….